Today we're excited to announce a new timeline feature for our Net Promoter Score (NPS®) polls, which helps you visualize your NPS performance over a 30-day window. If you want to know more about NPS and why you should measure it, keep reading; if you are already familiar with it, just skip the next section. 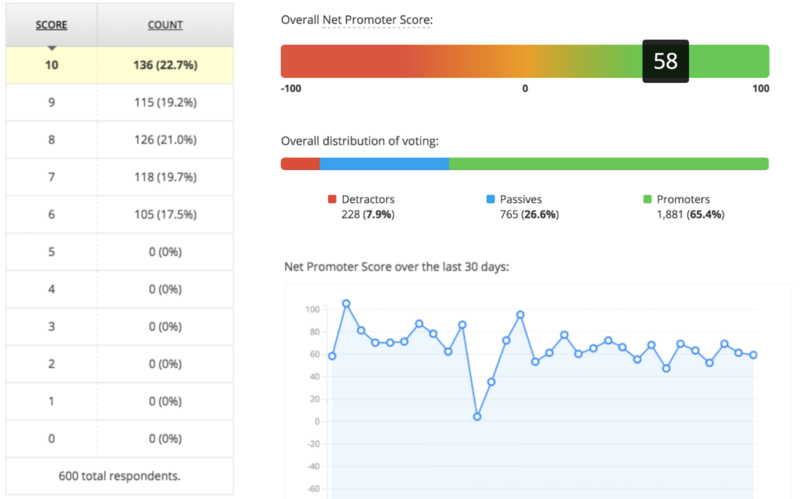 Your NPS (Net Promoter Score) is a measure of your customers' loyalty to your brand, products and/or services. You measure it by asking just one question: "On a scale from 1 to 10, how likely are you to recommend us to a friend our colleague? ", and then calculate it by subtracting the percentage of your "detractors" (who scored you 6 or lower) from your promoters (who scored you 9 or 10). You probably already know that you can use Hotjar to measure your NPS. We use it, too: you may have seen it recently after signing in to your interface. To try it out, follow these instructions to set up your own NPS polls — and don’t forget to reach out if you need any help!